Please refer to our stock # B-15 when inquiring. "A Potter's Work" by Bernard Leach. 1967 First Edition, Kodansha. Clothbound Hard cover with original dust jacket. Condition-New. 128 pages, 80 photographs, including 12 color plates, with long captions by Leach, plus 30 pages of drawings for pots. All will surely be of inestimable value to students, working potters, and all those interested in ceramic art. 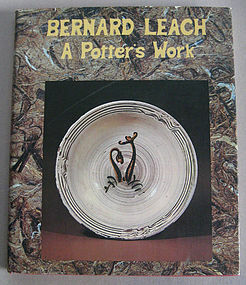 "Leach is undoubtably the most famous potter in the Western world. His contribution to the craft is unique - as teacher, writer, and philosopher who bridged the gulf between East and West, but above all as a practicing craftsman. He is also a successful author, but this is the first book to be devoted exclusively to his work."